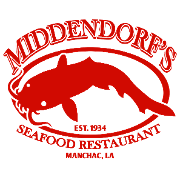 Middendorf’s is a longstanding seafood restaurant in Manchac, LA situated between the brackish lakes of Maurepas and Ponchartrain. We're best known for our “World Famous Original Thin Fried Catfish®.” The same mouthwatering recipe has been used since Middendorf’s was established in 1934. Our family friendly restaurant features outdoor waterfront dining; a sand play area with a Fishing Wishing Well/Fountain; an animal enclosure which includes a “Hansel & Gretel” style chicken coop with a variety of chickens plus a pond with Koi and white catfish; Middendorf’s Express G model train which delights children of all ages; a stunning, huge timeline chronicling the history of Middendorf’s and the surrounding area; plus the highly anticipated traditions of Fettuccine Frenzy and Oktoberfest. There’s definitely something for everyone at Middendorf’s -- a must-stop dining location for tourists & locals alike. It’s swamp dining at its finest and a truly one-of-a-kind experience.